in the naitonal news Wednesday. HAYWARD | When it comes to positive news, Hayward’s struggling school district rarely has its day in spotlight. That changed sometime after midnight Wednesday when The New York Times posted an opinion piece by Hollywood actor Tom Hanks writing glowingly of his alma mater, Chabot College. The national spotlight on Hayward schools continued later in the day. 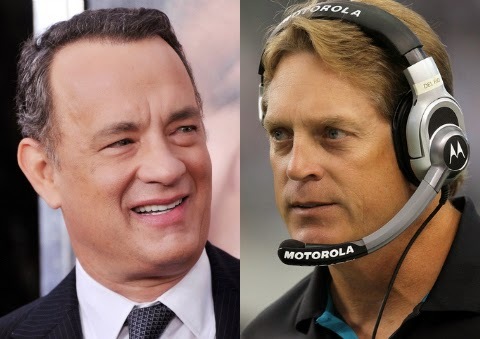 Numerous sources reported that Jack Del Rio, one of Hayward High School’s greatest athletes, is slated to become the next head coach of the Oakland Raiders. “We’re honored to welcome Coach Del Rio back to the Bay Area, and we’re immensely proud that he’s ‘Made in Hayward.’ He’s a true role model for all of our students,” said Stan “Data” Dobbs, Hayward’s superintendent. Since becoming superintendent of the beleaguered school district, it has been Dobbs’ intention to focus on the positive aspects of its students and their potential. The school district’s Made in Hayward Twitter feed, for instance, posted numerous photos of Del Rio from his high school days and his achievements as a multi-sport star who later attended U.S.C and starred as linebacker in the NFL and later as head coach. Aside from Wednesday’s news, the Hayward school district’s good fortune can be traced back to last December with the high-profile hiring of former State Senate Majority Leader Ellen Corbett. After being termed out of the Legislature last December, Corbett joined the school district as its executive director of advanced achievement. Posted in Chabot College, Ellen Corbett, Hayward, hayward High School, Hayward Unified School District, head coach, Jack Del Rio, New York Times, Raiders, Stan Dobbs, Tom Hanks. Bookmark the permalink. Corbett is Director of Institutional Advancement. She is in charge of raising money from State and Federal Grants and private donations among other duties. She should be able to raise hundreds of thousands, if not millions, of dollars for the District. Good choice for Hayward. Read the editorial in todays Daily Review.